Did you have the privilege of going into the poultry marquee? If you missed it make sure you enter next year. It is really an amazing exhibit to see. With over 300 birds of so many different types, the noise and the smells disappear very quickly. There were waterfowl and bantams, hard feathered and soft feathered birds, Wyandottes and Rhode Island Red breeds, farmyard roosters and furry pets and so much more. Our thanks again to Connolly’s Red Mills from Goresbridge for their continued sponsorship. 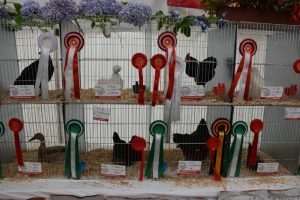 Red Mills have been sponsoring classes and championships at Iverk Show for many years – in fact longer than anyone else.